King County collects monthly water quality samples on Patterson Creek just upstream of the West Snoqualmie Valley Road bridge in the Snoqualmie River Valley. 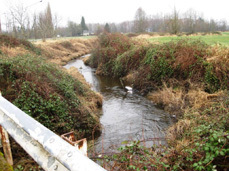 King County is not currently conducting benthic macroinvertebrate or stream sediment monitoring in the WRIA 7 Routine Streams Monitoring Program. Patterson Creek drains nearly 13,000 acres and is the largest left bank tributary to the Snoqualmie River downstream of Fall City, Washington (an unincorporated area of King County). The subbasin has a broad elevation range from 70 feet above mean sea level to more than 1,400 feet in the headwaters (King County, 2004). The mainstem originates in a low-gradient upland catchment with many lateral wetlands that extend nearly the entire length of the stream from Redmond-Fall City Road to the Snoqualmie River confluence (King County, 2004). Patterson Creek flows in a southeasterly direction for most of its length before turning north and intersecting the Snoqualmie River’s floodplain through farmland. Over half of total land use in the Patterson Creek basin is forest, which consists mostly of mixed forest and some deciduous and evergreen. There is some developed land, mainly low intensity and open space, and pasture/hay agriculture. Like many other tributaries in the watershed, the lower portions of Patterson Creek lie within an Agriculture Production District (APD). Scrub and wetlands combined make up about the same amount of land use as agriculture. Other land uses (barren land, grassland, and open water) represent less than 3% of land use in the basin. See Table 1 below for more details on land use. Much of Patterson Creek is considered Core Summer Salmonid Habitat by the Washington Department of Fish and Wildlife (WDFW) that requires special thermal protections. Fish habitat conditions in the mainstem of Patterson Creek are generally regarded as poor, owing to riparian degradation, fish passage barriers, and a lack of large wood in the stream (Haring, 2002). In spite of relatively poor habitat conditions, salmonids are known to make extensive use of the Patterson Creek subbasin. Steelhead and coho salmon use the mainstem and several key tributaries for both spawning and rearing. Chinook also utilize a substantial portion of the mainstem of Patterson Creek (Haring, 2002). State water quality standards were revised in 2003. Patterson Creek is now categorized as “Core Summer Salmonid Habitat” for aquatic life use and “Primary Contact” for recreational use under. As part of the updated water quality standards, portions of Patterson Creek have been assigned an additional “Supplemental Spawning and Incubation Protection” temperature criteria of 13 ºC to be applied from February 15th to June 15th. Patterson Creek is not listed on the Washington State Department of Ecology's (Ecology) 303(d) list for impaired streams. There are, however, two types of EPA-approved total maximum daily load (TMDL) plans in place and implemented: a Snoqualmie River Watershed Multiparameter TMDL for FC bacteria and DO; and a Snoqualmie River Watershed Temperature TMDL (Category 4a). A Water Quality Index (WQI) rating system was developed by Ecology that evaluates several water quality parameters and gives a single rating of “high,” “moderate,” or “low” water quality concern. To see how Patterson Creek ratings compare with other stream sites, please visit the Water Quality Index webpage. King County operates several stream gages on Patterson Creek: upper Patterson at Fall City-Redmond Road (48c), Patterson Creek upper at nursery (48Y), and Patterson Creek above 292nd Ave SE Bridge (48AN). While King County is not conducting benthic macroinvertebrate monitoring on Patterson Creek as part of the WRIA 7 Routine Streams Monitoring, King County (Roads) collected benthic samples on Canyon Creek in 2010. To see this data, please visit the Puget Sound Stream Benthos webpage.